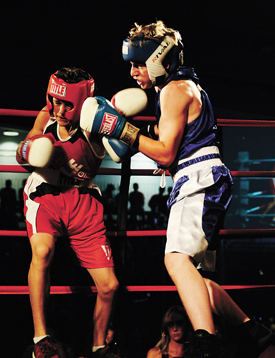 Many devoted Taber fight fans made their way to Milk River on Saturday to see the slew of local fighters at Teofista Boxing Series #32. Headliner Brent Anderson was able to push his record to 13-1 in a fight, with Pro Performance trainer Joel Mills noting Anderson had his hands full in the unanimous decision. The fight card started off with Wyler Langhofer whose fight ended up being exhibition due to the difference in weight and age. “He did awesome. He clearly would have won the fight had it been a legitimate fight, but it was good for experience,” said Mills. Jett Pedersen went toe to toe with his opponent which Mills referred to as ‘super durable’ and slightly heavier, losing a close decision. In what was the first of three decisions the Taber stable of boxers didn’t get, Mills added each fighter legitimately had a chance for the decision to go the other way. That included Gavin Kinniburgh’s decision. “Gavin was just as aggressive as his opponent. He came to fight and all our fighters had a great attitude,” said Mills. There was no grey area according to Mills in Jenna Langhofer’s controversial loss in an unanimous decision — it was highway robbery at its best. Reversing the sour taste in Taber fight fans’ mouths after that controversial decision was a dominating effort by Oskar Timofiejew who registered a TKO in the first round. Unfortunately, illness caused the fights of Brad Olson and Tiffani Olsen to be taken off the card. “Brad got sick on fight night and he was called off the show and didn’t get a chance to fight. Tiffani Olsen was up next and her opponent ended up getting sick and got pulled off the show,” said Mills.